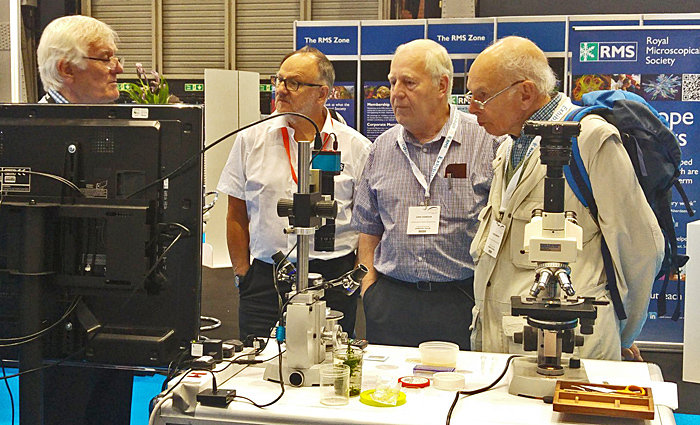 The Microscience Microscopy Congress Series is organised by the Royal Microscopical Society, and this year was held at the Manchester Central Convention Complex again, and included a conference, an exhibition and workshops. 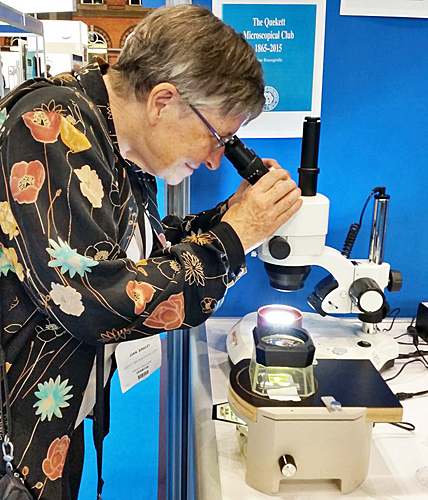 The Club had a stand in the exhibition area, manned by Carel Sartory, Joan Bingley, Pam Hamer, Ray Sloss, Robert Ratford and Stephen Parker. Visitors included Steve Durr. 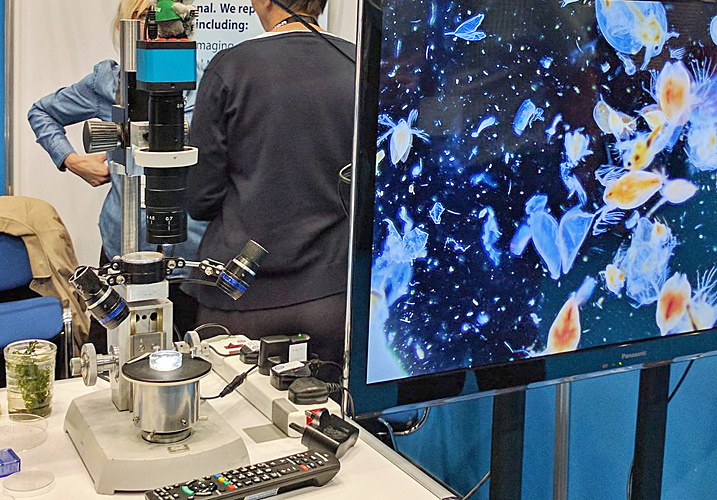 The main attraction on the Quekett stand was pond life displayed on a large television, imaged by a Chinese inspection camera mounted on a modified Zeiss stand with a couple of LED lamps. 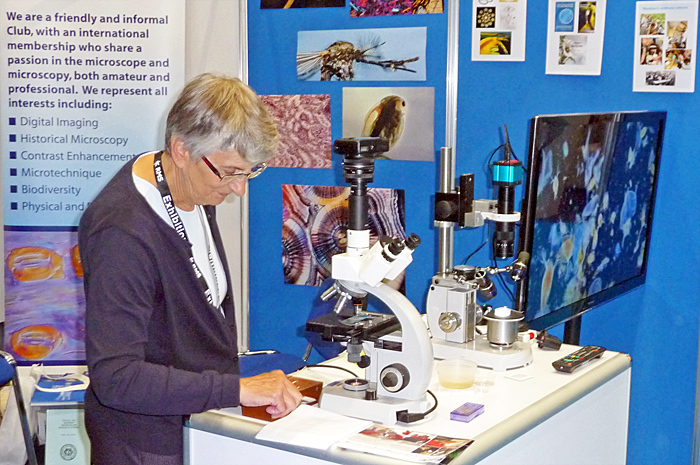 We also had a trinocular Zeiss standard with a Canon EOS-M mirrorless camera mounted afocally, a trinocular Chinese stereomicroscope, photomicrographs from annual exhibitions, and Jacky McPherson’s poster about amateur slide maker E. D. Evens. 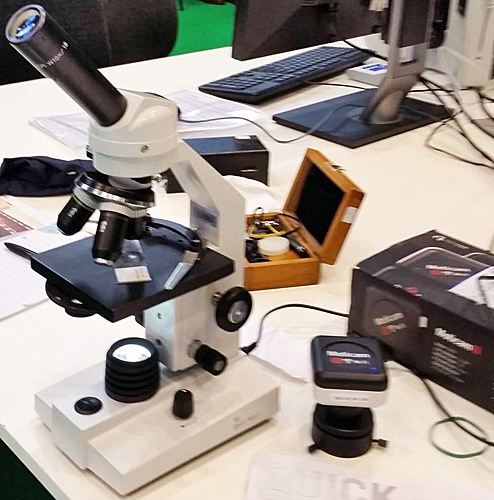 Overall it was a very successful few days; the stand was very popular, we made a number of very useful contacts and gained some new members including a new institutional member. 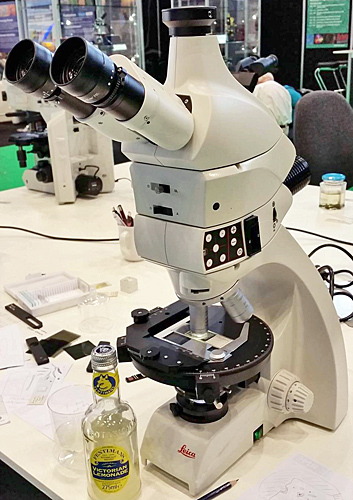 Ray’s set-up showing live Daphnia on the big screen was a real draw; Zeiss were so impressed that they asked for a sample to show on their system, but it looked very poor compared with ours! 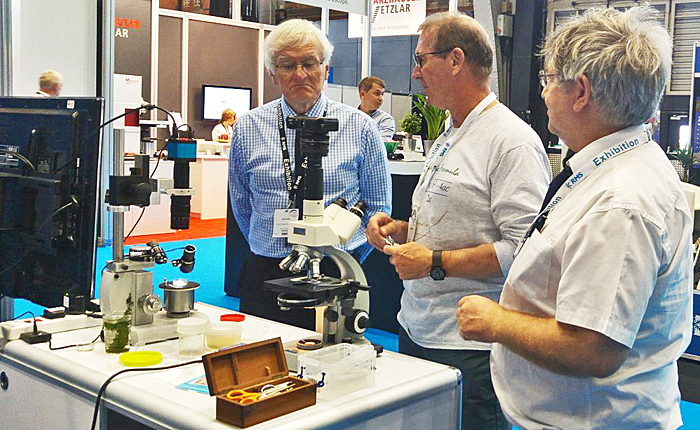 A number of delegates were kind enough to say it was one of the best stands there. 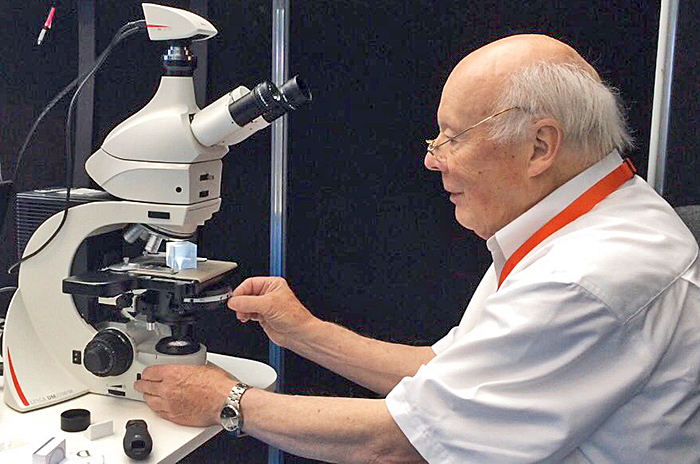 Peter Evennett was there too, but not on our stand, demonstrating Köhler illumination with a device that makes the light path visible. 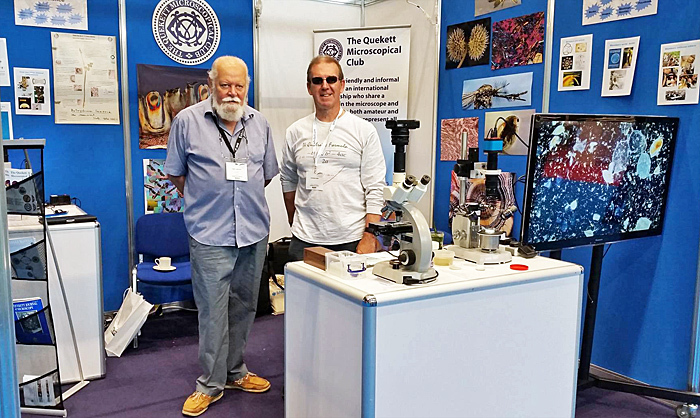 Photographs from 3 Quekett members, David Spears, Mike Crutchley and Mike Gibson, were short-listed in the imaging competition and were on display. 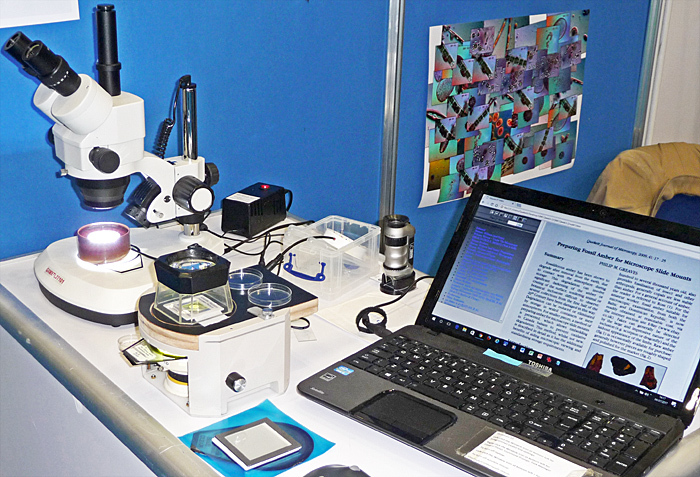 On other exhibition stands, microscopes ranged from basic to exotic. 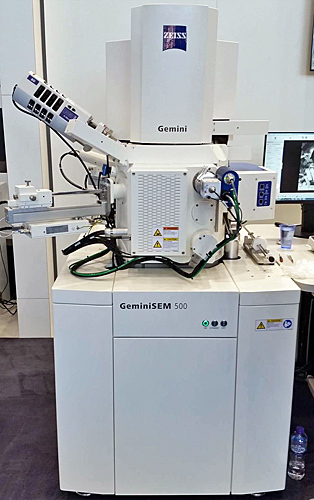 The BMS 10001RMS microscope meets the RMS specification for secondary schools. 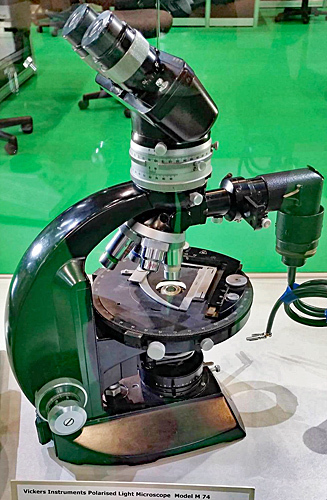 It is a monocular instrument with ×4, ×10 and ×20 objectives, and a proper condenser. 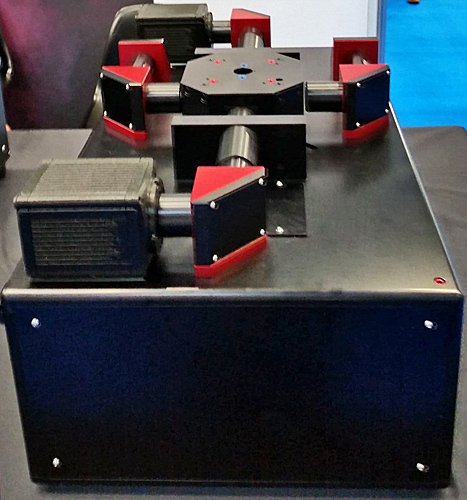 It has bright-field, dark-field and polarised light capabilities, with a 1 λ plate too. 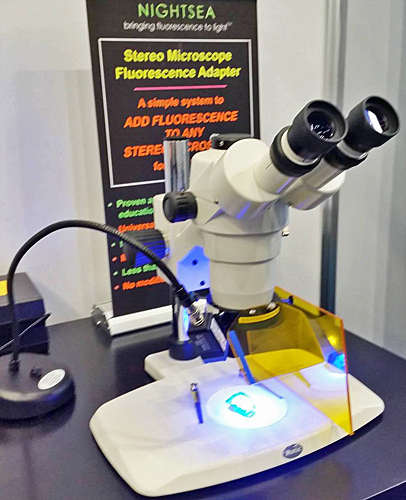 The illumination is an LED lamp, powered by rechargeable batteries. 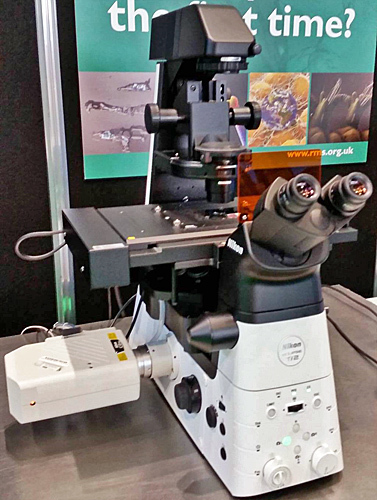 There were also some older but still interesting microscopes on display. 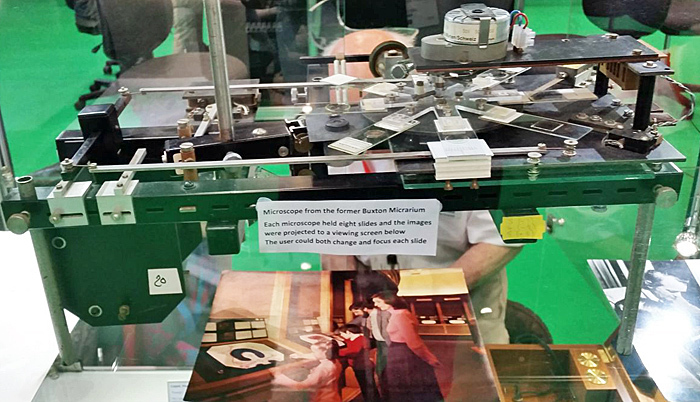 In the former Buxton Micrarium, each microscope held 8 slides and the images were projected to a viewing screen below. 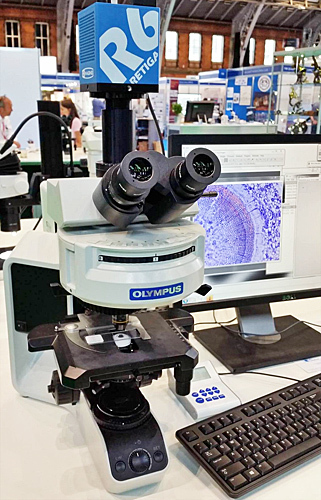 The user could both change and focus each slide.